A list of some of the more important historic moments for the DoD Edge Network! If you believe something should be added or removed, let me know. Feel free to post about some of your favorite memories. February - The beginning! DoD Edge Skyblock, an Ultimate Skyblock with a few parkour courses and dungeons. Gradual release of more parkour courses and dungeons. September - Hell on Earth released, made by HorribleGamer. Iron and Gold farms no longer allowed. November 24 - New dungeon Animal Farm released. January 11 - /skypvp released. January 13- New spawn released, made by FaliniFyreheart and Creep3rmuffin, with help from Nate (Devious) and Brecca. June 9 - Players restricted to flying in their own island region. Purchase Flight Permits to fly beyond the bounds of your island. July 1 - New host and hub! July 8 - Creative server now live. November 28 - #hand added to show the info on the item you are holding. March 9 - Updated to 1.9. March 31 - Updated to 1.9.2. June - Economy Survival released. July 5 - The End is now available for Survival. July 9 - Creative plots became available. September 9 - Added new starting islands on Skyblock. October 20 - x2uesday events added to Survival. January 6 - Moved from Enjin to current forum. January 21 - Creative plot world reset. Survival /payouts added. January 30 - The Laboratory minigame added. February 10 - Added bonuses and killstreaks to dungeons on Skyblock. March 3 - Slimefun added to Skyblock. March 6 - Added /dailybonus to Skyblock. Awards extra daily tokens, more for higher ranks. March 21 - Iron and Gold farms allowed on Skyblock again. May 9 - Survival Member+ shop added. May 10 - Survival lift signs added. May 15 - Can now use a Magma Block instead of lava for cobble gens on Skyblock. June 3 - Survival job center price updates. Additions and increases. June 30 - /sell added on Skyblock for selling mass produced resources. Rehaul to Island Challenges. DoD Gadgets added. July 8 - Mob Arena revamp on Survival. July 11 - Portal to Old Spawn added in Staff Hall on Skyblock. July 27 - Extra vote crates rewarded every 3 15 and 30 votes. August 18 - Removed the Haste buff at the Obsidian farm on Survival. August 21 - Survival spawn secrets remade. August 29 - /payouts removed on Survival. August 30 - x2uesdays removed, Multiplier Monday added. September 1 - /parkour menu added to Skyblock, all courses now playable. Loot still cycles biweekly. September 7 - /pweather and /ptime added for Creative. September 13 - The three highest donor ranks gain access to set homes in the Nether and End on Skyblock. September 14 - Added /clan /friend /party. September 18 - DIRT added to Survival. Random teleportation. October 3 - Mobcatcher added for Donor ranks and Token Shop. February 3 - Skyblock updated to 1.12.2. Island block values adjusted. Ice Plains and Flower Forest biomes available. Mob Catcher disabled. February 23 - Creative updated to 1.12.2. March 9 - Two new mazes on Skyblock by blackeyedgamer: Checkmate and Lab Rat. March 20 - Survival updated to 1.12.2. Mob revamp, loot system, loot shop/coins. Treasures disabled, Mob Catcher disabled. March 27 - Prestige system added to Survival. Active /jobs added. April 20 - SlimeFun removed from Skyblock due to endless bugs and issues. April 22 - New /trade gui and custom fishing added to Skyblock. May 1 - Direwolf20 1.12.2 modded server added. May 30 - Bones added, web currency. July 30 - Skyblock Classic added. September 21 - Survival mob revamp, Adventurers Guild added. October 16 - New Games section added to the website which includes an Arcade section with over 100+ games! November 4 - Modded Minecraft pack changed to Sky Adventures instead of Direwolf. December 18 - Modded Forge server closed. It will not always be available; instead, it will be an Event Server that will periodically be used for official random events, such as Minigames, Forge modpacks, Parkour Tournaments, PvP Tournaments, etc. December 31 - Free access to /tpa /tpahere /tpaccept on Survival instead of in the Token Shop. Ultimate Skyblock closed. Epic Skyblock to be released. January 30 - New NPC Trader available at /spawn on SBC. /warp shop. Mushroom Biome available. February 9 - New challenges added on SBC. New addition of my shop. Obsidian, Sugarcane, Birch Wood Logs & Planks, Sand, Red Sand, Clay Blocks, Clay Balls. Server Suggestions / Re: Economy Survival Suggestions - Post Here! Throwing this here for future quests. They're based them on Minecraft Achievements. I figure one quest every 5 levels is pretty good. So far we have up to level 30. No one else has gotten that high yet so I've put a pause on adding more. Taking suggestions for dialogue. 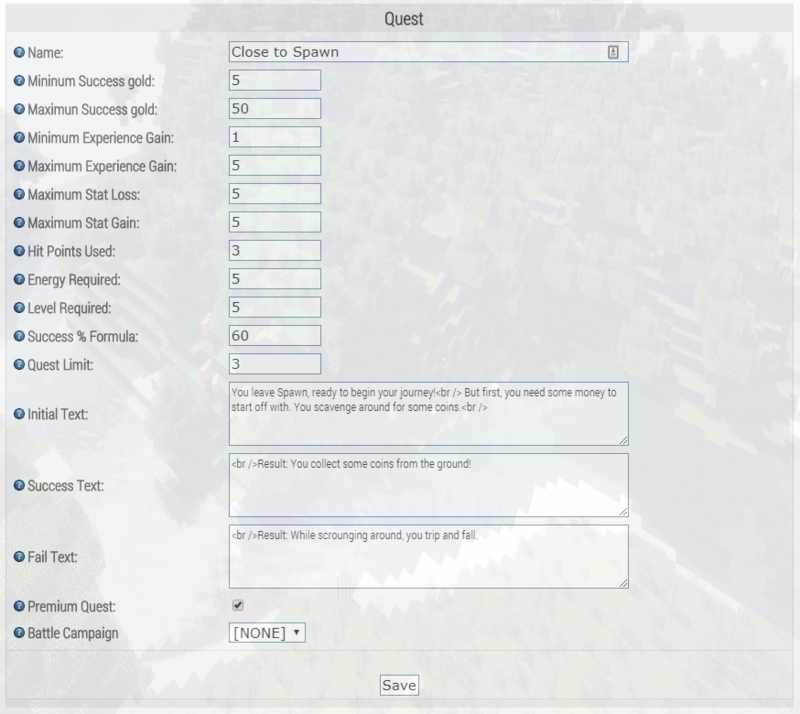 Each quest has 4 sections for text. Title, Initial Text, Success Text, and Fail Text. Then it has other information it needs as well for gold, exp, success rate, etc. Archer - kill a creeper with arrows. Return to Sender - success: while in the nether you come across a ghast that notices you and attacks! you slash your sword towards the approaching fireball and whack it back at the ghast. fail: you get hit and take massive damage and the explosion knocks you back. The Beginning? - gather wither spawning ingredients and spawn the wither. Bring Home the Beacon - construct and place a beacon. This small guide is for the Classic Skyblock Server on our Network. You can get here thru the /dod Server Select menu, right clicking the Classic Skyblock NPC at the Hub, or by doing the command "/sbc"
Mob Damage (such as Creepers exploding, Enderman stealing blocks) is Off. Use a sign with [Welcome] at the top to create an /is warp! Island border size is 100x100. You get two island sethomes. "/is sethome" "/is sethome 2"
Get to them quickly with "/ih" "/ih 2"
Personalize what people are allowed to do on your island with "/is settings"
Use "/vs toggle" to prevent falling in the void. Instead, you will be teleported to a solid block and have your hunger reduced. There are various Leaderboards around Spawn such as Jumps, Cake Slices Eaten, Kills, Deaths, Challenges Completed, and Trades Completed. If you right click on the sign, you can see more than just the top 3. You can find these at the Material Trader at Spawn at "/warp shop"
Forum Games / Re: Count to 1337! Forum Games / Re: Animal Alphabet! Forum Games / Re: Ban the Player Above You! Banned Larvitar22 for only playing on Forge.